Celebrate your memories of those endless summers rides back in the early years of mountain biking, back when suspension travel was short and stems were long, when fat tyre meant 2.2 and cassettes sprocket numbers weren’t edging into their teens. Join us in digging deep into MTB history with a race and show to celebrate the bikes of yore. 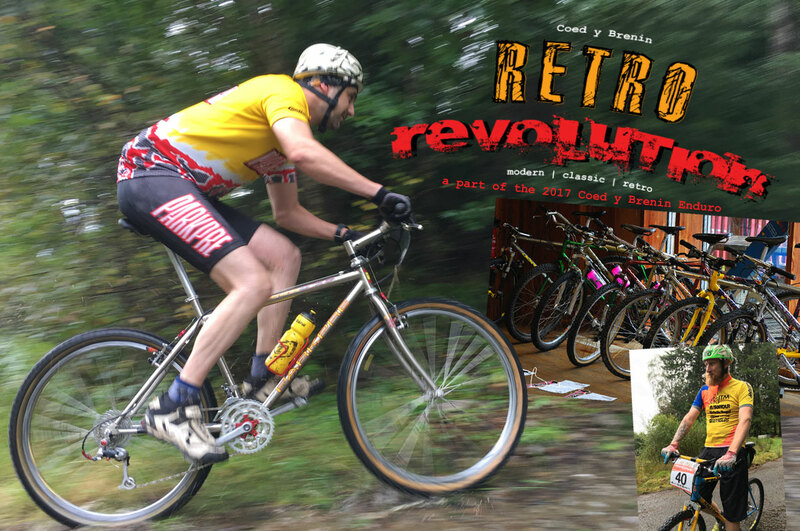 Last year’s Fat Tyre Revolution Race and show has now become a permanent fixture of the Coed y Brenin Enduro – Retro Revolution! Again we’ll be holding the race in celebration of the original, inaugural race held on the Tarw Du trail (then known as the Red Bull route) in the same format as the original, an individual, staggered start, off road time trial as a single (modified) loop of the trail. Race against yourself, your peers and the clock. The race is open to all riders 16+ with classes for standard and retro/classic MTB’s (those manufactured pre 1997). With prizes for M/F 1st, 2nd, 3rd XC (time over whole loop), 1st, 2nd, 3rd retrobike XC and also 1st DH (highest point on course to finish) and 1st Retrobike DH. The show offers the opportunity for those with classic MTB’s to display their pride and joy for all to see over the Saturday of the event weekend. The show will again be held in the conference room above the bike shop at Coed y Brenin (same location as event sign on). We are again offering free entry to the Retro Revolution race to anyone bringing a bike to display in the show so if you would like to come along and have a period, classic or retro beauty you would like to enter then please email Toby via mail@dyfievents.com for more details. The event will be peer judged by those showing with a prize to the chosen best in show!